From a soloist to a five piece band, the RayBans have an act for any budget or event. Contact us at 330.612.3376 to discuss the requirement for your event, and we’ll recommend the combination of personnel to make your special night a success ! Contemporary, Sophisticated, Versatile - these are some of the hallmarks of the talent-rich entertainment professionals within the RayBans. 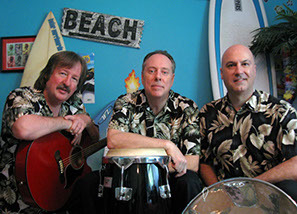 The RayBans have expertise in entertaining our audiences in a variety of genres, such as; Island & Beach, Contemporary, Motown/Soul/R&B, Disco, Classic Rock, Smooth Jazz. We have something that will appeal to each and every one of your guests ! Experience the feel of the Caribbean with our steel drum player Rich Maurer, as we perform the special Island themed selections on our repertoire. Clients love this music for their cocktail hour ! Supplemented by professionally produced backing arrangements, which exactly replicate the original recordings, RayBans creates a "full band" sound, with a minimum of performers. This unique approach distinguishes RayBans as a diverse, professional, and entertaining live act, providing as much "entertainment value" as other ensembles much larger in size. We specialize in smaller venues where band size and available space is a factor.